Kopi Akasaka has a wealth of experience working in the fashion industry. He received his undergraduate degree at St. Martins in London, and has worked in New York with brands such as A.A. Antonio Azzuolo and Thom Browne. He also has international experience in the design industry having worked with Tim Soar in London and Heaven Tanudiredja in Antwerp. His family is from Niigata and was impacted by the Great East Japan Earthquake on March 11th 2011. Kopi’s core fashion focus is on creating hand-tailored products, and he continues to work to perfect his craft through this fellowship. Why did you apply to The TOMODACHI-Uniqlo Fellowship? 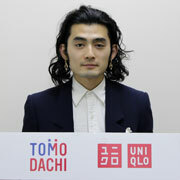 I applied to the TOMODACHI-Uniqlo Fellowship to help achieve my career objective of establishing myself as an independent fashion designer. My interest in Fashion Design and my desire to continue education in this field is as a result of my profound interest in culture, society and international relations. My Bachelor of Arts graduate collection at Central Saint Martins pooled all of these subjects together and was heavily inspired by my extensive research of men’s tailoring in the early 20th century, as well as relations between England and Japan at the time. I became deeply interested in this topic through combining these unique cultures and re-imagining the sartorial aspects. I intend to continue representing my native county through my creative practice, and through this become a strong contributor for the global fashion industry. I have been fortunate enough to receive the opportunity to develop my skills and receive financial support through the TOMODACHI-Uniqlo Fellowship. It is evident to me that the commerce and fashion business in the U.S., especially in New York, has an enormous influence on the rest of the world. Also, I am aware of the high level of prestige of Parsons The New School for Design and the curriculum they offer. By taking courses such as “Personal Identity,” “Design in Fashion System” and “Communication” I will have the opportunity to further learn more about my interests. Furthermore, the internship at Uniqlo will be a great opportunity to gain experience from a fashion company that has been extremely successful globally. Possibilities of earning publicity and variety of sponsorships associated with this course, networking through this program and living in a great environment for fashion would be significantly advantageous in achieving my career goal. Through this program, I will have the possibility to gain publicity as a TOMODACHI-Uniqlo Fellow and network in order to achieve my career goal. Having spent my youth in the 90s, I was heavily inspired by American pop music and subcultures. It has always fascinated me how despite being extremely far away from each other geographically, the United States and Japan share a captivating history that has formed into a strong alliance and friendship today.